What is the importance of recycling IT equipment? Did you know that up to 50 million tonnes of e-waste are disposed of worldwide every year? Would it also surprise you to know that, despite a growing push towards recycling IT equipment, the UK is one of the leading producers of electronic and electrical waste in the world? In fact, the UK is 5th on the list, producing 51.8lbs of e-waste per capita. 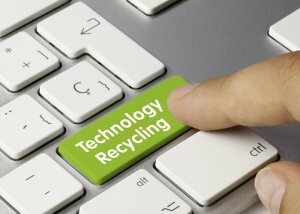 So, when we’re upgrading our business computers, laptops, and mobile phones, it’s vital that we all do our bit to ensure that we’re recycling IT equipment wherever possible. That helps to reduce the amount of electronic waste we’re sending to landfill, contaminating the area with toxic materials such as chemicals and heavy metals. It also helps businesses comply with the strict Waste Electric and Electronic Equipment (WEEE) Regulations 2013. IT equipment is one of the ten categories outlined in the legislation. You can find out more here. Every business has a duty of care to the environment and to people to ensure it is not creating pollution. In the case of some of the recyclable materials such as metals, they could also earn businesses funds for recycling them. 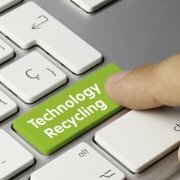 How much of my IT equipment can be recycled? Keyboard keys– These are plastic and are recyclable. They are generally shredded and sold on the commodities market as mixed plastic scrap, although some manufacturers such as Dell do re-use their own scrap plastics in a closed loop system to reduce the impact on the environment. The chassis– Some are wholly plastic and are recyclable in the same way as the keys. Others are mixed with carbon fibre which is not recyclable at the moment but can be burned in waste to energy systems. Batteries– The outer plastic casing is separated and recycled, then the rest is smelted down to metal alloys and slag, from which lithium is recovered. Fans and drives– Are made of plastic and can be recycled. Cables– Can be reused or broken down into plastic and copper wiring and the metal is recycled. The insulation goes to a waste to energy scheme. LCD screens– Many can now be recycled by separating the liquid crystals from the polariser foils and glass substrate. All three can be recycled. Mobile phones– Most mobile phones contain precious metals and plastics. They can be recycled to save the energy and the resources which would otherwise be needed to mine or manufacture them. When we’re recycling IT equipment, how do we choose the right waste management company? Look for a company with a proven track record in successfully dealing with WEEE waste, such as Inspire Waste Management. They will understand the complex rules associated with it and help you ensure your WEEE recycling is carried out correctly. https://inspirewaste.co.uk/wp-content/uploads/2018/12/it-equipment-recycling.jpg 500 700 Inspire-admin https://inspirewaste.co.uk/wp-content/uploads/2018/10/inspire-c-waste-e1540324531728.png Inspire-admin2018-12-06 16:28:552018-12-06 16:34:10What is the importance of recycling IT equipment?